Just accounts of my daily life. Compilation of general thoughts, experiences, and stories of trying to make it through each day. One of my favorite things about moving abroad is the opportunity to learn new traditions and about the culture you’re now living within. Iceland has not disappointed with its ability to teach me new things, from a new language to new foods to new holiday traditions. One of my favorite holiday traditions is how they view Santa Claus. For us in the States, it’s all about this one man who is watching all the children throughout the year and coming down the chimney with presents for all those who have been good. If you haven’t been, the only consequence was getting a lump of coal instead of awesome presents, which was enough of a motivation for me as a kid, but pales in comparison to how Iceland gets its children to behave. Enter the 13 Yule Lads, their mother, and the Yule Cat. You read that right, 13. Oh, and they are all trolls who spend the year living within caves in the mountains. The Icelanders view the Yule Lads similarly to how we would view Santa, just with a twist. Each of them comes down from the mountains, one by one, each day starting on December 12th, and if you’ve been good, you’ll get a present each night. The Yule Lads don’t come in through a chimney, or a door as I was told as a kid since we didn’t have a chimney; they come in through a window. In order to signal to them that you have a child living in your home, you’re to put a shoe next to the window with some kind of treat for their long travel. You can see the similarities with some uniqueness. Things really get different…and a bit scary when you add in the Yule Lads mother, Grýla, and the Yule Cat. 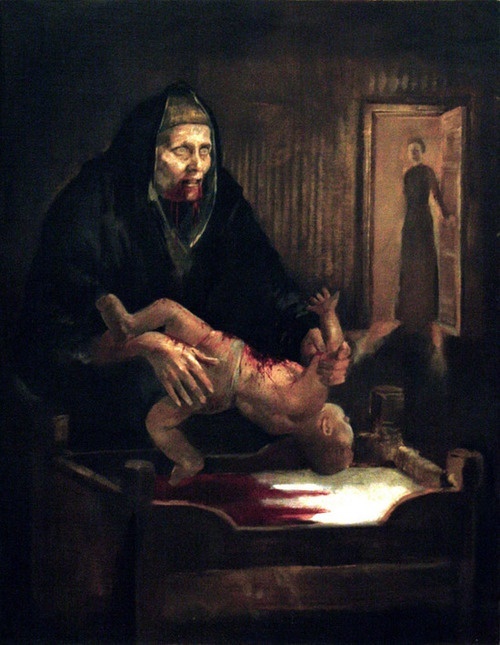 Grýla, also a troll, is the one who really motivates kids to be good all year. If you’re known to be a bad kid, instead of getting coal, she’ll steal you in the night, drag you off, and eat you. So…the punishment for being bad in Iceland is death..a bit more extreme than our fluffy Santa story. The Yule Cat also likes to eat children but doesn’t discriminate on age and will go after adults, too. He doesn’t care so much about whether you’ve been good or bad, though. He only eats those who do not have new clothing on Christmas Day. Now, I have some big issues with this – what about poor people who can’t afford new clothing, but rumor has it that apparently the story of the Yule Cat started as a way to motivate workers to shear and process sheep wool in a timely manner during the long, dark, cold winter months leading up to Christmas in order to make sure that everyone would be able to get a new piece of clothing. Using Christmas folklore to get workers to get on it..pretty genius. 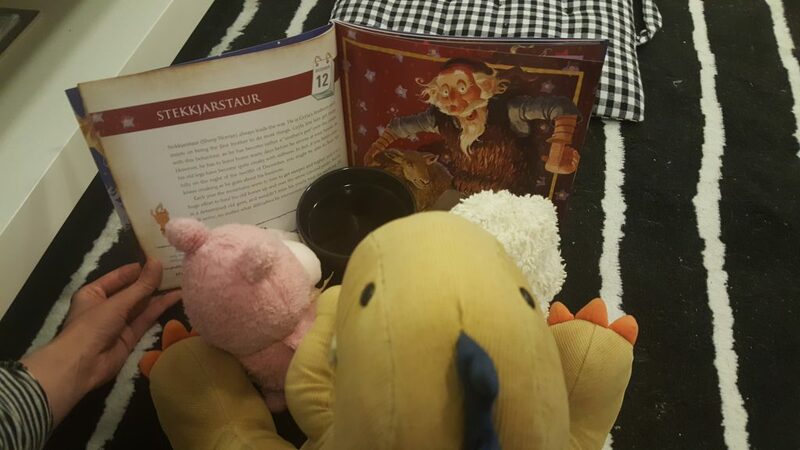 In order to teach ourselves about the new tradition and have some fun, I got us a children’s book that tells the story of each Yule Lad and we read it each night, from December 12th to Christmas Day. Reading our Yule Lads book! The book was actually really helpful in understanding each one and more about the tradition. So, if you ever find yourself curious about traditions in another culture, find yourself a children’s book. There also have been poems written about each Yule Lad – literature and sagas are a huge part of Icelandic culture, so this wasn’t a huge surprise. If you’re interested in these, the Icelandic Magazine came out with an article of all of the poems translated to English. They are worth a read, as some are pretty entertaining. I hope this has been helpful in giving you an insight into the new culture we live in and that it’s been entertaining in some respects. I’ll try to share more about Icelandic culture in the future.